Bone tissue is one of the main components of the skeletal system (other components include bone marrow/marrow cavity, collagen fibers etc). Like other tissues in the body, bones are made up of specialized cells that serve different functions. Osteoblasts - are the type of cells that form the matrix and collagen fibers. They are derived from osteoprogenitor cells and are responsible for building new bones as one grows. They are also important in that they help rebuild bones in the event that they break. 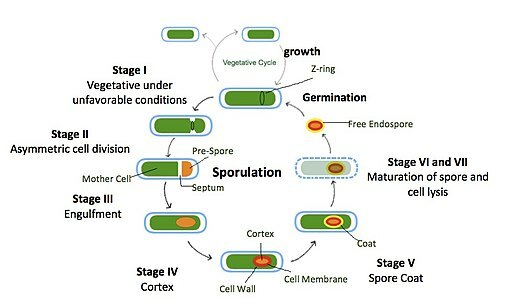 These processes involve the cell (osteoblasts) accumulating at a give spot to form osteoid (flexible material) that hardens when material (minerals) are added to it. Osteocytes - are old osteoblasts that no longer serve to form new bone. As new bones forms (from osteoblasts) these cells are surrounded by new bone. Therefore, Osteocytes remain embedded inside the bone as new bone continues to form. As such, they may be described as the principle/mature cells of bones. Osteoclasts - Osteoclasts are larger cells compared to the others and play the role of breaking down and reabsorbing the bone through phagocytosis. Although they are very active when bones are broken, they also help ensure that bones are not overly produced or degraded. The other type of bones cells that are not often mentioned are the lining cells that are located on the surface of all types of bones. Lining cells form from osteoblasts and play the role of covering the surface of bones. * Bones are primarily formed through two processes namely; intramembranous ossification and endochondral ossification. Whereas intramembranous ossification involves the condensation of mesenchymal cells at ossification centers, endochondral bones are formed in the presence of cartilaginous blastema. Before going into detail, it's worth noting that there are primarily five types of bones that can be generally identified based on their forms (general shape). Long Bones - Long bones develop through the endochondral ossification process and include those located in the appendicular skeleton such as the tibia and femur. They have a shaft part that connects the two ends referred to as epiphysis (mostly spongy bone with a thin layer of compact bone). The metaphysis, which is the point between the shaft and epiphysis, is often the point of growth during development. Short Bones - Short bones are largely composed of a thin layer of compact bone that covers vast spongy bone and marrow. This causes them to appear cuboid in shape. They serve to provide support and stability and include such bones as the carpal and tarsal bones. Flat Bones - Unlike short bones, two layers of compact bone cover the spongy bone and marrow in flat bones. Examples of flat bones include ribs, scapulae and skull bones. Sesamoid Bones - These bones are largely found at the end of long bones and include such bones as the patella bone located in the knee. They primarily serve to protect tendons from excess wear. Irregular Bones - With irregular bones, a thin layer of the compact bone cover the spongy bone. This category is largely categorized by the content of the bone rather than the shape. It includes such bones as the hip and vertebrae. The endosteum - This is a thin membrane that lines the cavity of the bone marrow. As such, the endosteum lines the inner surface of the bone (such as long bones) thus surrounding the marrow. Periostem - This is a tough membrane that can be seen covering the length of the bone shaft. However, it does not cover the cartilage part. The membrane also consists of a fibrous layer and osteogenic layer that makes nourishment and repairs possible. Compact Bone - Compact bone is also commonly referred to as cortical bone. It is dense (because of calcified matrix) with tiny spaces known as lucanas. To the naked eye, the compact bone is a solid layer present as the external layer of all bones. Because of its strength, the compact bone makes it possible for the bone to support weight. Spongy Bone - Also referred to as cancellous bone, spongy bone is composed of porous tissue and contains the bone marrow (it surrounds spaces filled with red bone marrow). While it is not as hard as compact bone, spongy bone plays an important role of protecting the marrow where blood cells are produced. Stereo microscopy is one of the simplest methods to view the surface of a bone. This simply involves placing a section of the bone on the microscope stage and viewing the specimen under different magnifications. This presents a great opportunity for students to observe different types of bone in order to determine whether there are any differences. For instance, students can compare a bone that has a covering outer membrane and those without the membrane. Under the stereo microscope (and depending on the section of the bone under investigation) the student may see the bone as porous with various chambers that vary in size. 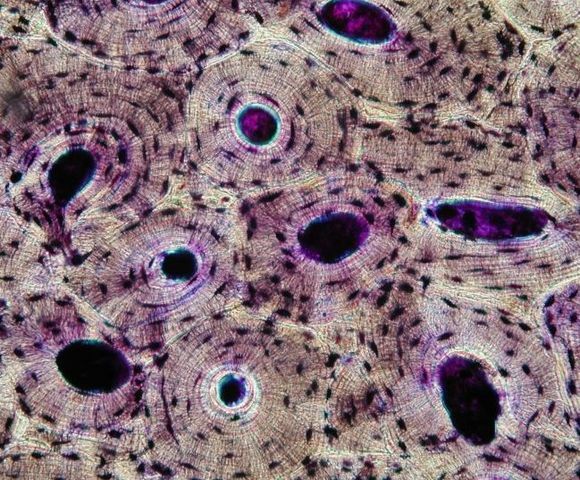 To view a bone tissue under the microscope, the bone sample has to be carefully prepared in order to produce a specimen that will provide the best possible results. Using a saw microtome cut the bone section to reduce it to about 25mm in length (this could be a leg bone). 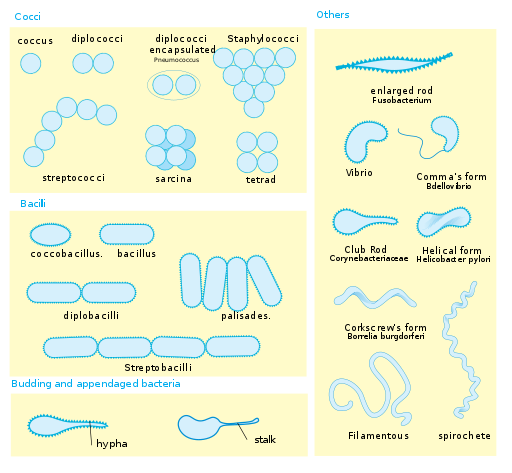 When viewed under the compound microscope, the section will show various patterns across the surface. In particular, students will see various concentric layers that make up the Osteons. These layers may contain numerous spots (lacunas) with conduit at the center of each osteon known as the Harversian canal. Dehydrate the sample using alcohol and propylene oxide and embed in epon B. 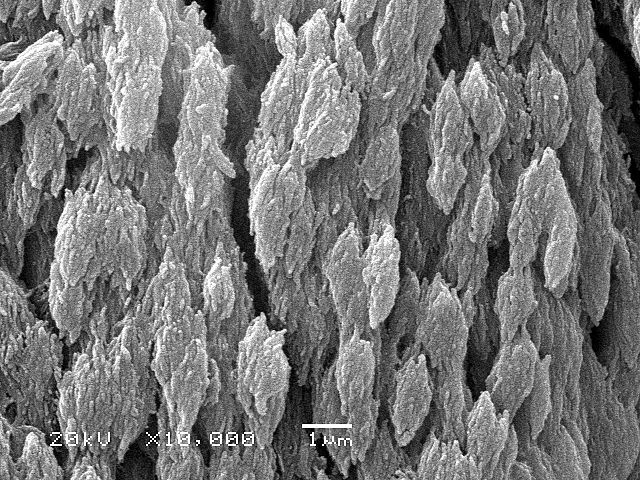 When the bone section is viewed under transmission electron microscope, it is possible to see collagen that makes up most of the organic matrix. In addition, students can see the osteoid tissue, which is uncalcified matrix. 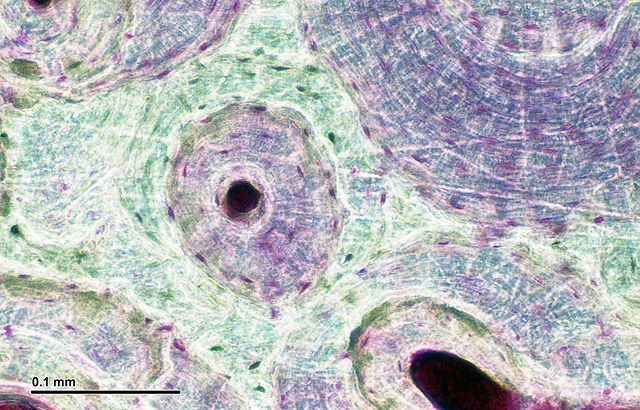 Under the light microscope, students can see Osteons, which consist of concentric layers that are also referred to as lamellas. As mentioned, conduits referred to as Haversian canals are at the center of these layers. These are important features of the bone in that they hold vessels through which blood and lymph are circulated. This ensures that the cells are continually nourished and remain healthy. The small, dark spots (lacunas) that can also be seen contain osteoblast cells that form matrix and collagen fibers. The lacunas can also be viewed as connected to each other through what seems like very thin lines. 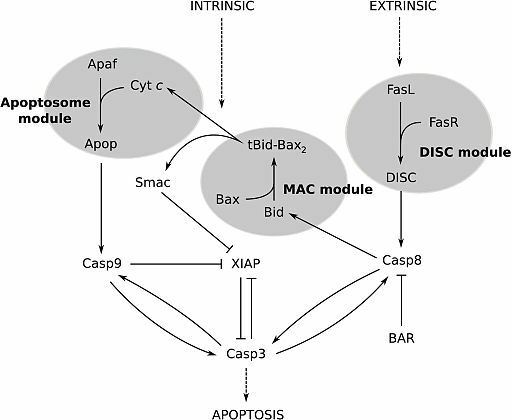 These systems are known as canaliculi and allow for gaseous and metabolite exchange. If students view a spongy bone under the microscope, it will be possible to see the numerous pores across the surface. These pores serve to hold not only some marrow, but also nerves and vessels that transport blood to the cells delivering nourishment and gas exchange. Georges Boivin, Chantal Anthoine-Terrier & Karl J. Obrant (2009 Transmission electron microscopy of bone tissue: A review.